A futuristic Formula 3D Circuit Race planned for Carmarthenshire this summer has been officially launched. 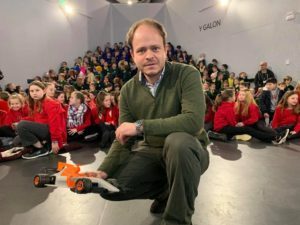 Teams of children from eight county primary schools will take part in the 3D printed remote control car race, which is earmarked for Carmarthen Park’s velodrome in July. At a launch event in Canolfan S4C Yr Egin in Carmarthen, Swansea University loaned 3D printers to each participating school. Children will now start work on 3D printing and assembling their remote control cars, having already secured sponsorship from regional car dealerships. Team Mazda will be represented by Ysgol Gynradd Nantgaredig, Team Kia by Ysgol y Dderwen, Team Ford by Ysgol Teilo Sant, Team MG by Ysgol Llanybydder, Team Citroen by Ysgol Llanllwni, Team Volvo by Ysgol Carreg Hirfaen, Team Hyundai by Ysgol y Bedol, and Team Subaru by Ysgol Peniel. Sponsoring car dealerships include HG Bryer of Dryslwyn, Gravells of Kidwelly, J & J Motors of Cross Hands, OC Davies of Carmarthen, Bassetts of Carmarthen, Lloyd Motors of Aberaeron, John F Hutchings Ltd, and Howards of Carmarthen. Each 3D printed car is based on a Daniel Norée design. Carmarthen Town Council is confirmed as an event sponsor, with local businesses due to provide snacks and refreshments on the day. The project, led by Swansea University’s College of Engineering in partnership with Carmarthenshire County Council, was initiated at Ysgol Gynradd Nantgaredig – a pioneering primary school where children are being introduced to digital technologies like 3D printing from a young age. Dr Dimitris Pletsas, of Swansea University, talked hundreds of children through the use of 3D printers and other ‘smart manufacturing’ technology at the launch event. He said: “The Formula 3D Circuit Race won’t just be fun for participating children – it’ll also be educational because of the engineering, design, IT, problem-solving, marketing and teamworking skills they’ll learn. “The race will be a terrific event, but what’s more important is the journey these schools will embark on to adopt this type of technology as part of their teaching and learning environments in the longer term. The development of smart manufacturing means more and more businesses across the world are starting to use advanced technology like robotics, artificial intelligence and 3D printing to become more efficient and profitable. As well as 3D printing, assembling, painting and testing their cars, schoolchildren will also be tasked with picking team colours and negotiating advertising deals for the race event. Tiny cameras will be mounted on each team car for replay and viewing, with drone photography also being provided on the day of the race. Each school taking part will have a pits area at the velodrome, where sponsoring car dealerships will display their latest models.